That, folks, is an attempt to put into writing a signature element in Led Zeppelin’s sound – the kind of monster shuffling groove that John Bonham laid down so often. An inadequate impression I know, and only one aspect of Zeppelin’s many-faceted aesthetic. But still, that kind of thunderous rhythm from Bonzo is the kind of thing that got songs by subsequent rockers labelled as “Zep-esque”. Why am I mentioning this? It’s because I want to recall a short-lived Anglo-American outfit from the Seventies who appropriated elements of the Zeppelin sound more effectively than most. That band were Detective. cavernous sound to match. And there are variations on the Bonzo theme on a few other tracks into the bargain. Hyde was probably the most un-Bonham like dude you could come across – a total abstaining health freak before such a lifestyle became fashionable. But boy did he get that Bonham drum sound down. Hyde’s drumming isn’t the only reason for the Zeppelin comparison. There are some Page-like riffs and layering in there too. 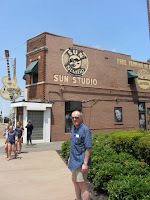 And apart from elements of their sound, it so happened that Jimmy Page took a shine to Detective, they signed for Swan Song, and at one stage Page was slated produce them. Comparisons were inevitable. Now, comparisons can be odious, but in this case it doesn’t mean that Detective were just unoriginal copyists. They were far better than that. So for the uninitiated, who the hell were they? 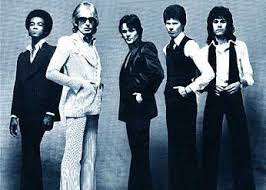 The two key proponents of Detective were Brit vocalist Michael Des Barres and American guitarist Michael Monarch. Des Barres had been singer with glam rockers Silverhead - this month featured in a Classic Rock article on bands signed by Purple Records by Geoff Barton, of whom more later. Monarch, meanwhile, had been in none other than Steppenwolf, cranking out the riff on ‘Born To Be Wild’, before hooking up with Hyde and ultimately bringing him into the Detective equation. That’s the twitching shuffle on ‘Grim Reaper’, counterpointed with a lurching guitar riff from Monarch in a distinctly Zep-like fashion, and jack-knifing into explosive rolls around the kit for emphasis. The others in the line-up were no bums either. On keys was Tony Kaye, once of Yes fame, bringing extra layers to the sound on the likes of ‘Grim Reaper’. And on bass was Bobby Pickett, a former member of Sugarloaf whose latest gig had been backing Etta James, indicative of someone who could (and did) bring funk to the bottom end when required. The reason all this is deemed a Flashback is that my first introduction to Detective was a review in Sounds, the inky weekly that I read for years in the 70s and 80s, by the aforesaid Geoff Barton. To be honest I don’t recall the review in detail, but I’d hazard a guess that it was fairly positive, and made the Zeppelin comparison. What I most remember is Barton describing Des Barres’ holler of “RECOGNISSHUN!” on the opening track, making it sound like a statement of intent from a self-confident bunch. A little while later I came across a copy of the album in some record library, and so inevitably taped it onto one side of a C90, as one did back then. And then let it rip. Detective had more strings to their bow than the whole Zeppelin thing. The opener ‘Recognition’ is subdued to start with, before opening up in a relaxed arrangement and featuring a tasteful solo from Monarch. ‘Nightingale’ kicks off in a mellow mood that could be the prototype for the kind of AOR that would make Foreigner famous, before revving up into a powerful crescendo, on which . . .
. . . Jon Hyde detonates some pounding flourishes to underpin proceedings. It sounds better than that, of course. ‘Detective Man’ is a slice of uptempo boogie, propelled by a strutting riff from Monarch and decorated by some rock’n’roll piano from Kaye. And ‘Wild Hot Summer Nights’ is a handsome cousin of Wild Cherry’s ‘Play That Funky Music’. With all this to their credit, why weren’t Detective huge? Same old, same old really - substance abuse, delays in recording that cost them a mint, loss of momentum, less well received second album. So it goes. But they were still responsible for a damn good album of hard-hitting, funky rock. 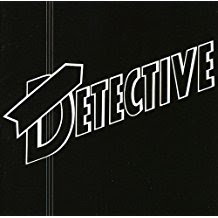 Something put me in mind of Detective last year, so I did some exploring and came across a cd reissue on Rock Candy Records. It’s been getting regular plays ever since. You can find the whole album on YouTube - check it out. Although the basis for this piece is my own impressions and recollections, full credit to Paul Suter for his excellent sleeve notes for the reissue, which filled in the gaps in my knowledge.